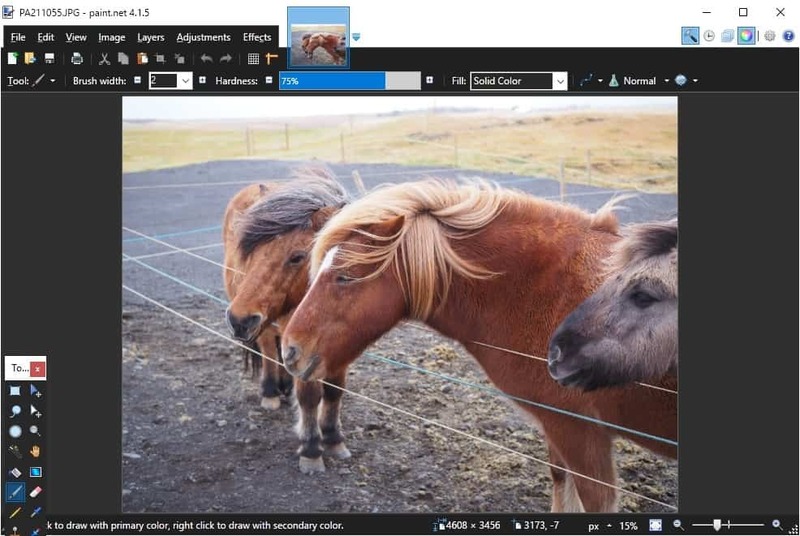 The developer of the image editor Paint.net released version 4.1.5 of the application for Microsoft's Windows operating system today. The new version of Paint.net is available on the Microsoft Store and as a Win32 program that users can download from the official project website. Paint.net users who run the program already on their devices should receive update notifications when they run the program the next time. A click on Settings > Updates > Check Now runs a manual check for updates right away; Paint.net should pick up the new version and install it when that is done. Paint.net 4.1.5. features performance improvements. The last version of the application improved application start significantly and it seems that work on improving performance of the application continues in this version of the program. Optimized a portion of the rendering engine for newer CPU instruction sets (SSE2, SSSE3, AVX2). Depending on zoom level, CPU type, and other factors, rendering throughput has been improved by 10-50%. Whether you will see improvements in this regard depends on the processor of the computer the image editor is run on, the zoom level, and other unnamed factors. Rotate operations should be near instant in the new version next to that. You can rotate any image that you loaded in the image editor either by selecting Image and then one of the Rotate options, or via the shortcuts Ctrl-H, Ctrl-G, and Ctrl-J. I ran a couple of tests with 10 Megabyte images in PNG and JPG format, and rotate did indeed process these instantly. Image -> Rotate should now complete almost instantly. Last but not least, Paint.net 4.1.5 includes optimizations that effect plugins may benefit from. Performance of these plugins should improve in the new version. Some performance optimizations for code that uses the indexers on the Surface class, which should improve effect plugin performance. Paint.net 4.1.5 includes a number of fixes next to that which you can check out on the roadmap; at least one crash issue fixed in the Store version. We followed Paint.net's development for a long time. Our first review dates back to 2009, and the program has received numerous updates since that time. 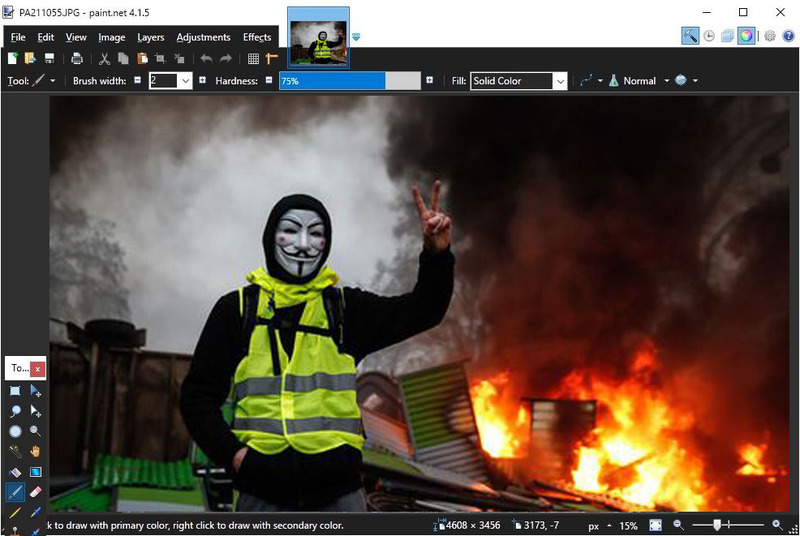 Now You: What is your preferred image editor, and why? I have not used that program in quite some time, but, it was interesting. It supported layers. So, some of the processes one does in gimp can be done in Paint.net. I’d rather say that a lot of things one does in Gimp can also be done in PN, provided you install just a few of the many plugins that are available for PN. And even with plugins, PN has a much, much more intuitive user interface that the mess that is Gimp. In principle (but I don’t know how hard that would be, technically) I do agree with the comment by @dark (below) that it’s a pity there is no Linux version of PN. I’ve been using PN on Windows for many years now because in my own case, it offers the perfect compromise halfway between too-simple and way overloaded. When I happen to be on Linux, I often sorely miss something that’s as excellent as PN. You omitted a download link. That’s really annoying. Good that it was added, but why only an inline link. Ghacks has a lot of writeups on applications. Why not a big, clearly visible button that always look the same and links to the main site of the discussed application. Place it in the same position at the end of each article. Much better than having the user search around for the link. What program would you recommend if I don’t have any photos of pony’s to edit? Is it a space station? Paint.net should switch to .net core and get ported to Linux and deliver to Linux via Snap, Flatpak or AppImage. Paint.net is a free program so why Microsoft tries to swindle users into paying ~$7 for the app on Microsoft’s store ? The developer uses the money to finance development. That’s a version made by the dev that gives you a couple of extra perks in exchange for the 7$ as a donation option. I use Paintshop Pro X4. I really like it, except since one of Ms update it will not run. Great program. Much more user friendly than Gimp. Many updates and no changes; improvement of existing features, bugs corrections yes; but nothing more. Paint.net got a poor text tool, poor brushes, 16 bits colors, no raw, we can’t number all lacks, if GIMP can do a complete revival ( hard because it’s a linux software ) paint.net will vanish into the air. Paint.net is not aimed at (semi) pro image editing, so it’s fair to compare it to Gimp or Affinity Photo (!). Krita have not a gmic Installer. Gimp has an gmic Installer. Paint Net is better for Windows.